Do you know how to get Delphiniums to bloom in your garden? I've always wanted to have Delphiniums in my perennial border with tall spires of blooms in all shades of blue reaching for the sky. I had moderate success a dozen or so years ago, but after a season of bloom, the delphiniums always disappeared from the garden. Last year, I did some research and decided to try some Foerster hybrids. I purchased seeds, sowed them indoors and ended up with several nice little delphinium seedlings. Then one day I put the seedlings outside and while my back was turned, something ate them and they were no more. Like any gardener, I watered the remaining pots of dirt for awhile, but no miracle sprouts came back and I temporarily gave up on my delphinium dreams. But we don't give up on our gardening dreams that easily, do we? No! This spring I sowed more delphinium seeds and planted the seedlings out into the garden last week. I don't know if they'll make it, but I am hopeful. In the meantime, I've discovered the secret to getting delphiniums to bloom in my garden. How's your summer reading program going? I hope that the June-July selection of the Garden Blogger's Book Club, People with Dirty Hands: The Passion for Gardening by Robin Chotzinoff, is at the top of your stack of books to read. "I am so excited that people are going to read this 10+-year-old book that I wish I could send all of you a drywall bucket full of aged rabbit poop, which I consider to be the best compost of all. Seriously, this is great for me. If you have any trouble finding the book, contact me through my blogsite and I can send you one, cheap and signed." Yes, you can contact Robin via her blog, People With Dirty Hands, and she'll hook you up with the book, cheap and signed! Then to participate in the book club, just read the book and write a post about your thoughts on it, what struck you as funny, what parts you identified with, or anything else related that you think of. Or, you can go with "door number 2" which is to read one of the following books about specific passions for gardening and write a related post. Or if you want to participate in the book club without ever reading a book, you can do so by writing a post about someone you think has a passion for gardening. It could be someone you look up to and admire for their passion for gardening, or a gardener who helped you be a better gardener or a mysterious gardener that you haven’t really met, but you’ve seen their garden and wonder what they are like. Or contact your favorite garden blogger and interview them via email and write a post about that. If you’ve been thinking about joining in the Garden Bloggers’ Book Club, this is the perfect time to do so, with so many ways to do it. Don't make me beg! I'll post the virtual club meeting post on July 31st with links to everyone's related book review or gardener interview, but you can post whenever you'd like before then. You don't have to wait until July 31st. Just let me know via a comment or email when you do post, so I can visit your blog and get the link. Over on Plurk, I commented that I bought a plant that the people at the greenhouse didn't know much about, except it was from Australia and they called it "Joey". Can anyone help identify it? I just hope it isn't some roadside weed over in Australia, but is a nice cultivated flower. At least it is going to be a nice cultivated flower in my garden, growing in this pot. I hope. The flowers kind of remind me of clover, but they are much bigger. The foliage is smooth and so far there is just that rosette of leaves with the bloom stalk coming up out of it. And by now you are dying to know the secret to getting delphiniums to bloom in your garden, aren't you? I'm not telling this secret to just anyone, and I bet you know what it is and you've done it yourself. Buy the plant already blooming! I'm reading People with Dirty Hands right now, Carol. What fun to read the book of someone we've actually met and shared a pitcher of Texas martinis with (or iced tea). Clever girl, Carol. I don't have any problems with delphinium growing or blooming...just with what I call the "great delphinium and peony-flattening wind and rain storm" which we get every year just at the peak of bloom. I stake things but they often fall over anyway. Oh well. When I went on Amazon, I didn't have any trouble finding a copy of Robin's book. Almost wish I had now, as I'd like to have her autograph it. Oh well, perhaps she'll be at another garden bloggers meeting...there WILL be one, yes? Please?? haha, I'm kidding.. I'm excited to start reading this book! thanks for the recommendation. You are too funny! Isn't it amazing that you can grow the weirdest things, but them have trouble with a relatively easy plant like delphinium? LOL, Carol. I planted my first delphinium this year with visions of those tall spikes of purple you described. I didn't know I had to buy one already blooming! So far it has survived a flood and strong winds, but doesn't seem to be getting any bigger. Let us know how yours turn out this year. I'm reading 'People with Dirty Hands' right now, and I'm just loving it. Great choice! Yes, Delphiniums are expensive annuals. If I had good soil in full sun I might try them. Your delphiniums are beautiful. I have never had any luck with them. . .sigh. Pam/digging, I agree, it's nice to have a face to put with the name of the author. When I met and talked with Robin, I didn't know she had written this book, then later someone said, "Did you know..."
Jodi, That is sychronicity across the miles. A further comment below will take you to a website with the positive id of the plant. Nancy, You could always buy a 2nd book from Robin, I'm sure she wouldn't mind. As for another garden bloggers meet-up, I've heard fall of 2009 in Chicago is a possibility, but I'm not in the loop on it, so don't know for sure. SJP8987, I do what I can! 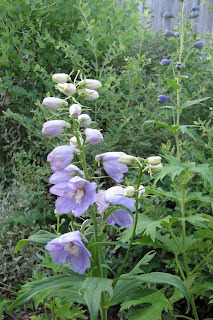 Sherry at the Zoo, I don't see any Delphiniums growing in your garden, so how do you know they are an easy plant. "Double dog dare you" to try to grow one! Rose, I will keep all posted on my Delphinium dreams or disasters, as the case may be. I do have another one I bought earlier in the spring, without a bloom spire, and it doesn't show any signs of doing anything. Colleen, Great to hear you are reading the book. Mr. McGregor's Daughter, And they can be annuals that don't even bloom. Molly, Thank you, that is exactly it! Cathy, Try buying some in bloom like I did!